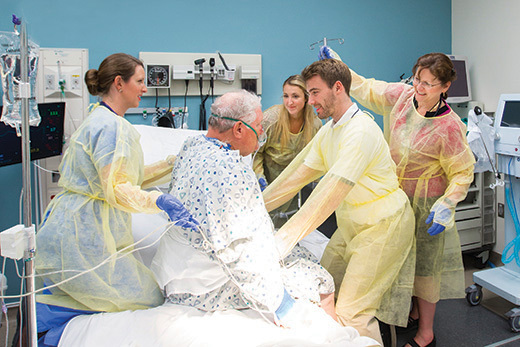 Jenny Sharp (l), Courtney Beshel 17DPT (back center), Eugene O’Hanlon 17DPT, and Kathy Lee Bishop mobilize an acute care patient as part of a simulation. Johnson knew she had a decision to make. She could continue to avoid critically ill patients with complex conditions—or she could learn everything she could to overcome her fear. Because she wanted to be able to work in a hospital, she decided on the latter. Because she was a student in Emory’s Division of Physical Therapy, there was a clear way to get the information and experience she was looking for: Emory’s Advanced Acute Care elective. It’s the first and only preprofessional course in the United States dedicated to understanding and treating the acute care patient. For course co-instructor Jenny Sharp 11DPT, the idea began with a chance meeting in an ICU at Emory University Hospital Midtown. Alex Truong, MD, MPH, had been conducting research on the benefits of early mobilization, a set of coordinated protocols to help even the sickest patients begin to sit, stand, and walk again as quickly and safely as possible. He wanted Sharp’s support in creating a protocol for treating patients in intensive care who could benefit from physical therapy. For other health care professionals, encouraging critically ill patients to be physically active can seem counterintuitive. “All everybody sees at first is risk,” says Sharp. Yet research shows that the adverse reaction rate for early mobility efforts is between 1% and 3%. The most common reactions are drops in oxygen saturation and blood pressure. In addition, research by Truong and others has shown that bed rest for patients may hurt more than help. “In the old model of acute care treatment, patients just languished in bed and became very weak,” says Sharp. Recent studies show that a stint of hospital bed rest may lead to weakened states for subsequent years—including decreases in nerve conduction, debilitating muscle weakness, and resulting challenges in going back to work or family life. Research has also shown that early mobilization efforts can result in decreased complications, shorter lengths of hospital stays, and lower hospital readmission rates. Soon, Sharp found herself serving as an early mobility coordinator at Emory University Hospital Midtown, training other staff members on the benefits of getting critically ill patients moving. At the same time, she was doing what she could to gain confidence and competency with her own acute care patients. “I was educating myself on the different equipment and medical diagnoses that you typically see in critical care,” she said. Occasionally, Sharp would think back to her coursework at Emory. “The electives I had taken were fabulous, but none of them prepared me for what I was doing in acute care,” says Sharp. In 2012, she started drafting an email to Professor Marie Johanson, PhD, PT, OCS, who chairs the division’s curriculum committee. Might Emory be open to creating an advanced acute care elective? she asked.